- Customization of Designs & colour pattern possible. For reasons of quality maintenance, the offered range of Marble Plates are known to be made in accordance with the set industry norms and guidelines. Priced at the most reasonable rate possible, its preference in the market is quite high. In addition, the offered range is designed in the most attractive manner possible. - 12, 15, 18, 21, 24, 27, 30, 33, 36, 39, 42, 45, 48, 51, 54, 57, 60, 63, 66 inches etc. Note : Prices depends on Size, Marble Quality and Carving Work. 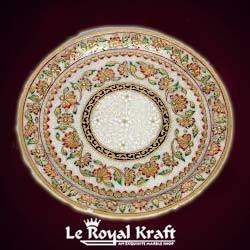 Marble meenkari plates made with white marble and decorated with meenkari painting work. With an impressive growth record in this highly competitive industry, we are providing a qualitative range of Marble Handicraft Plate. We are offering a superior quality Designer Marble lotus plate / Marble lotus Bowl to our most valued clients. These Designer Marble lotus plate / Marble lotus Bow are made by using superior quality raw material which ensure its quality and durability. These Designer Marble lotus plate / Marble lotus Bow are available in various types and we offer at wholesale rates. Fine Decorative Marble Pooja Plate Available In Different Designs & Sizes. Our clients can avail from us a broad range of marble name plates. In our team, we have expert craftsmen who can engrave various designs and names on marble. These marble plates are available in various sizes, shapes and designs with suitable colors and graphics being engraved upon them. We are leading manufacture all kind of handicrafts items.the Item made by good quality marble & gold painted. 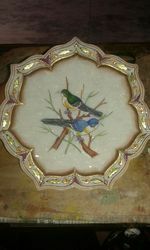 - The marble plate has a very pretty floral designs nd border and an attractive painting. - The wonderful detailing of the gem stone paining makes it look all the more eye-catching. - These wonderful home decor pieces are sure to increase the aesthetic ambiance of your place.